More than 100 rally crews will contest the longest stage-rally in Britain next week, Rally Isle of Man organisers have confirmed. Last year teenager Arron Newby became the youngest ever winner of the event in its 50th year alongside Manx co-driver Rob Fagg. Arron Newby and Rob Fagg won by more than two minutes. The pair will defend their title next week at the near 200-mile race. 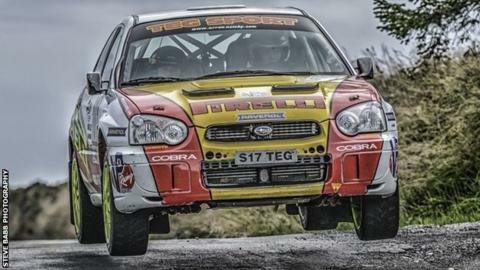 This year's rally will include a number of classic stages across the island and will run from the 11-13 September. Rally Isle of Man is part of the 2014 MSA British Rally Championship, forming the final two rounds of the series with Ireland's Daniel McKenna and Welshman Osian Pryce in contention. More than 100 crews from all over Europe, Australia, the UK and the Isle of Man will participate in the rally, part of the British Historic Rally Championship, which begins on 11 September with the shakedown stage before the first stage on Douglas promenade. The following day crews will tackle 13 closed road special stages across the island between headlined by the double run through Castletown in the evening before a further seven stages on Saturday. The supporting NGK BRC Challenge Trophy will also be decided.